Perfect for getting in and out of vehicles with a simple, smooth motion, the Adapt Solutions XL Base rotates and gently lowers out of your vehicle. The XL Base is ideal for anyone of any height and the rotation and lowering system can be paused at any time during use. The XL Base is installed in your vehicle and uses your vehicle’s original seat. This ensures your seat is the perfect size, offering you comfort, safety and enough leg room. By backing up your seat completely, you’ll be able to get an idea of how much room an XL Base will provide you with. 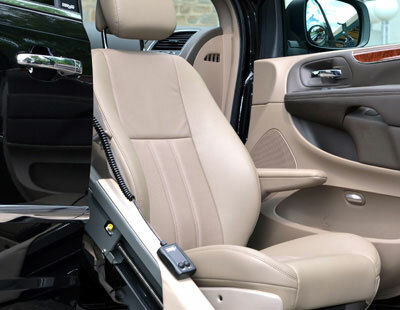 Because the XL Base is installed beneath the vehicle’s original seat, other passengers in the vehicle will enjoy the same level of comfort as before the base was installed. One of the biggest advantages to the XL Base is that many people don’t even notice that it’s there! Installation of the XL Base does not require any modification to your vehicle which ensures that it can be easily removed whenever you’d like. You’ll be able to return your vehicle to it’s original state which means that it won’t affect the resale value of the vehicle. The XL Base uses a simple mechanical design. It uses two electrical actuators and a series of limit switches. To learn more about the XL Base and whether it is compatible with your vehicle or minivan, please contact the mobility experts at Goldline in London, Ontario.